President Ibrahim Nasir, the first President of second republic, was the son of Velaanaagey Ahmed Did and Fathimath Didi. 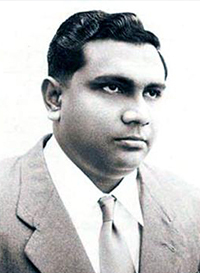 Ibrahim Nasir served as Prime Minister of the Maldives under Sultan Muhammad Fareed Didi from 1957 to 1968 and succeeded him to become the first President of the Second Republic from 1968 to 1978. Ibrahim Nasir was sworn in as the first president of republic of the Maldives on 11 November 1968. He was widely credited with modernizing the long-isolated and nearly unknown Maldives and opening them up to the rest of the world. His foremost work included that of bringing Maldives to the United Nations even with the opposition of some nations that felt awkward at including a nation of such a small size. He laid the foundations of the nation by modernizing the fisheries industry with mechanized vessels and starting the tourism industry. He was credited with many other improvements such as introducing an English-based modern curriculum to government-run schools. He brought television and radio to the country with formation of Television Maldives and Radio Maldives for broadcasting radio signals nationwide. Under his watch, the national shipping line with more than 40 ships that were plying the oceans of the world remained a source of national pride for Maldivians. Nasir is considered as the independence hero of Maldives. He brought about the independence of Maldives from being a protectorate of the British Empire. He directed the building of the first international airport in the Maldives (Malé International Airport).